Electricity is such a central part of everyday life that we forget how dangerous it can be. We interact with electricity from the moment we turn our alarm off in the morning until we switch off the lights at night. The ever-present role of electricity in our lives can make us complacent when it comes to the risk it poses. The risk of injury and death by electrocution is present with voltages as low as 230 volts, so it is important to always be aware of electrical hazards, especially in high-risk environments like construction sites. Electrical injuries are caused by the flow of electricity through the body and the heat this generates. Electric shocks occur when the current is given an opportunity to ground itself. If a person touches a power source, the electricity will try to travel through their body to the ground. The path the current takes through the body heats up and burns the body from the inside. In this article, we are looking specifically at overhead power lines, but it’s important to remember contact with electricity is a significant risk in the construction industry even outside overhead lines. Sites are full of machinery and tools that can cause electrical shocks. To mitigate risks, it is vital to make sure all equipment is well maintained. Work zones in the vicinity of overhead electric line poles (provided by Safe Work Australia). When it comes to overhead power lines, all power lines should be treated as active. Above all else, the most important thing to do when controlling potential electrical hazards is contact the electrical entity for your site. The electrical entity in charge of the area you are working in can provide all of the necessary information about risks, voltages, underground utilities, exclusion zones and any other potential hazards. They can apply visual reminders of line locations, such as tiger tails or power line markers, and can insulate power lines on request. If necessary, they can also isolate lines from the grid during construction so that they no longer pose a risk. To mitigate the risks of working around power lines, exclusion zones have been established to set up safe working distances for vehicle and machinery that is active around power lines. Exclusion zones mark the distance that machinery, tools and workers should maintain at all times from live wires. The absolute ‘no-go zone’ in Australia is 3 metres/10 feet from the overhead wires on a pole (low voltage less than 133 KV) or 8 metres/26 feet from the overhead wires on a transmission tower (high voltage or greater than 133KV). When establishing your exclusion zones, you should factor in the movement of the wires and all possible movements of the equipment and its load. Direct contact with power lines is the greatest risk while working within exclusion zones. However, it is also possible for electricity to arc from power lines to nearby objects — the possibility of electricity arcing from power lines increases as the voltage they are carrying increases. Overhead power lines statistically pose the greatest risk of electrical injury and death on worksites. Most contacts with overhead power lines are caused by heavy machinery, although items carried by workers also pose a significant risk. Of heavy equipment, the majority of contacts are made by cranes. If a crane makes contact with a power line, immediately contact the electricity entity for your location. If it is safe to do so, move the crane or mobile plant so that it is no longer in contact with the power line. If it is safe for the operator to stay inside the cabin of the crane they should do so until the power lines are isolated and they are given the all clear. If not, they should jump clear being careful not to touch the equipment and the ground at the same time and avoiding contact with conductive surfaces. Once on the ground, the operator should hop or shuffle away from the equipment with both feet together until at least 10 metres away from the nearest point. Do not run or walk as contact with multiple points on the ground carrying different voltage may cause an electrical current to pass through the body and cause an electric shock. Other workers within 10 metres of the equipment should follow the same protocol when moving to a safer location. Do not touch anyone who is receiving an electric shock. Secondary electric shock is a real danger, and you should not attempt to rescue anyone receiving an electric shock or administer first aid until they have been removed from the flow of electricity. Some protective technologies can be used with cranes to decrease the risk of electrical shock. Available technologies include proximity devices, boom cage guards which shield the boom from making contact with power lines and insulated links between the crane hook and the load which prevents electricity from travelling to the load. 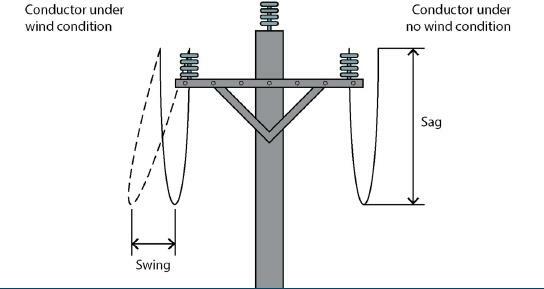 The height and voltage of overhead electric lines (and the horizontal safety clearance if applicable) must be assessed at the site (provided by Safe Work Australia). Be aware of Electrical Safety Legislation relating to working around electricity and ensure all workers are familiar with the relevant sections. The use of a trained spotter helps minimise the risks within the vicinity of power lines. Ensure all new members of the work group, as well as any visitors to the site, are inducted to the Risk Assessment for any potential electrical hazards. Know the location of overhead power lines and underground cables. Ensure safe distances are maintained from all power lines. Ensure operators of machinery or delivery vehicles are aware of the height of their vehicle or load and they have been advised of power line locations. Provide ground barriers to warn workers of the presence of overhead power lines and underground cables. Be aware that under no circumstances must anything be attached to or built around power lines, poles, pillar boxes or other Electrical Entity equipment. Be aware of changing site conditions (e.g. prevailing or unexpected winds and their strength and direction; the terrain and possibility of unexpected ground surface movement under plant; and vehicular traffic, pedestrians or livestock that could interfere with the work, damage as a result of storm activity). Fully assess the nature, size and shape of loads (e.g. load stability, dimensions and surface area facing the wind; whether loads are conductive—all materials should be treated as conductive unless confirmed otherwise—or could become conductive when in contact with high voltage material; and whether loads being carried above electric lines may accidentally fall onto them). Wind can make the electric lines swing from side to side. Approach distances for vehicles should be increased by the amount of conductor sag and swing (provided by Safe Work Australia). When a contact happens with a boom-truck, the operator is usually the one who is electrocuted. When a contact happens with a mobile crane, the rigger or ground worker is most often electrocuted. Generally, the contacts happened during movement of the machinery and not during setup or take-down procedures. As well as direct injury from electrical currents, there is a risk of tyres exploding or catching fire for up to 24 hours after an electrical incident. Pyrolysis causes a build-up of flammable gases and pressure within the tyre and may rupture or explode.